Here is an interesting example of what led Intel (and other manufacturers) to start locking down multipliers on their processors as well as adding anti-counterfeiting measures. 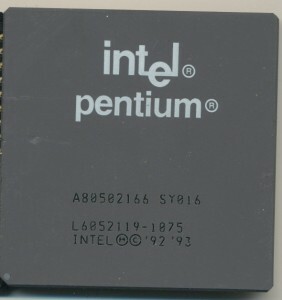 This processor appears to be a 166MHz Pentium Processor, which in 1997 sold for around $200. A 120MHz Mobile Pentium sold for less than $100. Thus processors of lower speeds were often remarked by unscrupulous dealers and sold as higher speed parts. 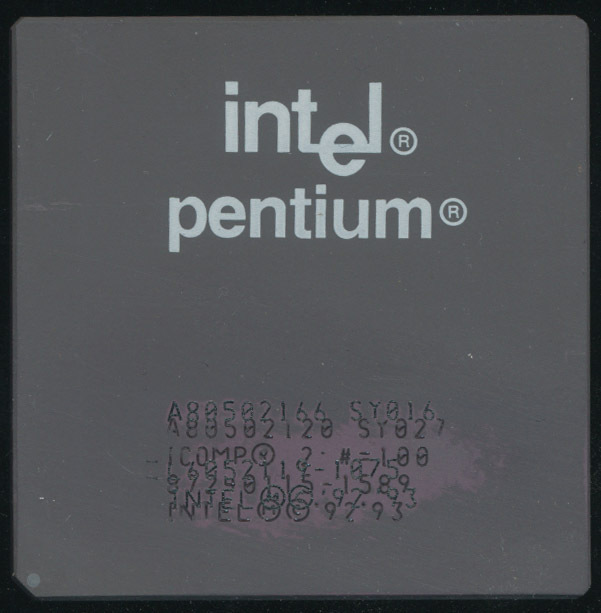 The forgeries had to be made quick, as processor prices dropped very quickly, the 166MHz Pentium debuted at nearly $1000. 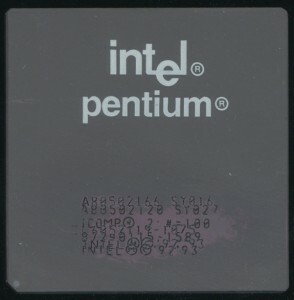 Most Pentium fakes were made by painting over the original markings and painting/engraving news ones. Some of the better fakes ground down the old markings first. Nearly all are easy to spot by the trained eye, wrong fonts, date mismatches, etc. This particular example, from somewhere in 1997, was faked from a Pentium 120MHz mobile to a 166MHz desktop Pentium. As far as fakes go this was a fairly conservative one. Often 166s were faked from 100s or even 75s. The 120 was a 2x60MHz processor running at 3.1V, while the 166 is 2.5×66 (you see why locking the multiplier discouraged faking?) running at 3.3V. This resulted in a 28% overclock at about a 6% voltage increase. In this case the processor likely ran fairly well, if perhaps a bit warm. Some of the more extreme fakes resulted in very unstable systems due to overheating and pushing a processor well beyond what it was designed for. Today counterfeit chips are still a major problem, though it was shifted from the consumer market, where prices are generally low, to the military and industrial market, where prices are high, and there is still demand for older devices.